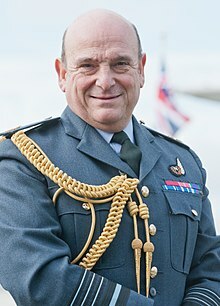 Air Chief Marshal Sir Stuart William Peach, GBE, KCB, ADC, DL (born 22 February 1956) is a senior Royal Air Force officer. After training as a navigator, Peach commanded IX (Bomber) Squadron and then became Deputy Station Commander RAF Bruggen. He was deployed as NATO Air Commander (Forward) in Kosovo in 2000. He went on to be Chief of Defence Intelligence in 2006, Chief of Joint Operations in 2009 and the first Commander of Joint Forces Command in December 2011 before being appointed Vice-Chief of the Defence Staff in May 2013. Peach succeeded General Sir Nick Houghton as Chief of the Defence Staff on 14 July 2016. He succeeded General Petr Pavel as Chairman of the NATO Military Committee on 29 June 2018. Peach was born on 22 February 1956 in Staffordshire, England, to Clifford Peach and Jean Mary Peach. He was educated at Aldridge Grammar School, in Aldridge, Staffordshire. He studied geography, economics, and social history at the University of Sheffield, graduating with a Bachelor of Arts (BA) degree in 1977. He later studied at Downing College, Cambridge, and completed a Master of Philosophy (MPhil) degree in 1997. Peach was appointed an acting pilot officer on 1 September 1974 and was commissioned on graduation from university as a substantive pilot officer on 15 July 1977; he was promoted to flying officer on 15 January 1978 and to flight lieutenant on 15 October 1978. A navigator, Peach was posted to No. 13 Squadron in 1979 and served a tour on the English Electric Canberra in the photographic reconnaissance role before being transferred to IX (Bomber) Squadron in 1982 where he served on the ground attack variant of the Panavia Tornado in the UK. He transferred to No. 31 Squadron in 1984 and served on the Tornado in Germany. Promoted to squadron leader on 1 July 1986, he became a Qualified Weapons Instructor and received the Queen's Commendation for Valuable Service in the Air in the 1990 Birthday Honours List. After Staff College in 1990 he returned to Germany to serve as Personal Staff Officer to, in turn, Deputy Commander RAF Germany, Commander-in-Chief RAF Germany and Commander Second Allied Tactical Air Force (of which RAF Germany formed a part), being promoted to wing commander on 1 July 1991. Peach saw action as a Detachment Commander in Saudi Arabia during Operation Jural. From 1994 to 1996 Peach commanded IX (Bomber) Squadron operating in the Strike, Attack and SEAD role, also acting as Deputy Station Commander RAF Bruggen. Stuart Peach in MTP Uniform. Following promotion to group captain on 1 July 1996, Peach became Director Defence Studies (Royal Air Force) in 1997, commissioning scholarship, editing books and writing articles on air power: he secured an MPhil from Downing College, Cambridge at that time. In 1999 he was appointed Assistant Director of the Higher Command and Staff Course at the Joint Services Command and Staff College (having previously graduated from that course). 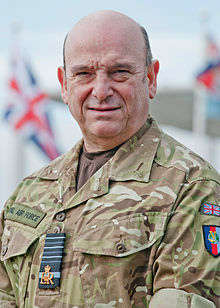 Peach served as Commander British Forces Italy from 1999 to 2000 and NATO Air Commander (Forward) in Kosovo in 2000, as a result of which he was appointed a Commander of the Order of the British Empire on 6 April 2001. He was then appointed Commandant of the Air Warfare Centre and Assistant Chief of Staff Intelligence at RAF Strike Command, being promoted to air commodore on 1 January 2001. Promoted to air vice marshal on 1 August 2003, Peach served as Director General Intelligence Collection from July 2003 to March 2006. He was promoted to air marshal on 17 March 2006, and appointed Chief of Defence Intelligence, becoming Chief of Joint Operations in March 2009, having been appointed Knight Commander of the Order of the Bath (KCB) in the 2009 New Year Honours List. Peach was promoted to air chief marshal and appointed the first commander of the new Joint Forces Command in December 2011. He went on to become Vice-Chief of the Defence Staff in May 2013. As of 2015, Peach was paid a salary of between £190,000 and £194,999 by the department, making him one of the 328 most highly paid people in the British public sector at that time. He was appointed Knight Grand Cross of the Order of the British Empire (GBE) in the 2016 New Year Honours. On 22 January 2016, the Ministry of Defence announced that Peach would succeed General Sir Nick Houghton as Chief of the Defence Staff in summer 2016. Peach took over on 14 July 2016. He succeeded General Petr Pavel as Chairman of the NATO Military Committee on 29 June 2018. Peach married Brigitte Ender in 1986; they have one son and one daughter. He is President of the RAF Rugby League; he is interested in sport, military history and cooking and has an honorary DTech degree from Kingston University and an honorary LittD degree from the University of Sheffield. He is an Honorary Fellow of Downing College, Cambridge. Peach, Stuart (1998). Perspectives on Air Power. The Stationery Office. ISBN 978-0117728882. ^ a b c d e "Air Chief Marshal Sir Stuart Peach KCB CBE ADC DL BA MPhil DTech DLitt RAF". Ministry of Defence. Retrieved 22 January 2016. ^ "No. 46432". The London Gazette (Supplement). 16 December 1974. p. 12878. ^ "No. 47352". The London Gazette (Supplement). 17 October 1977. p. 13103. ^ "No. 47437". The London Gazette (Supplement). 16 January 1978. pp. 607–608. ^ "No. 47670". The London Gazette (Supplement). 23 October 1978. p. 12646. ^ "No. 50583". The London Gazette (Supplement). 30 June 1986. pp. 8719–8720. ^ a b "No. 52173". The London Gazette. 15 June 1990. p. 27. ^ "No. 52591". The London Gazette (Supplement). 1 July 1991. p. 10091. ^ "No. 54453". The London Gazette. 1 July 1996. p. 8919. ^ "No. 56168". The London Gazette (Supplement). 6 April 2001. pp. 4244–4245. ^ "RAF Senior Appointments" (PDF). September 2011. p. 58. Retrieved 22 January 2016. ^ "No. 56078". The London Gazette (Supplement). 2 January 2001. p. 14622. ^ "No. 57018". The London Gazette (Supplement). 5 August 2003. p. 9733. ^ "No. 57931". The London Gazette (Supplement). 21 March 2006. p. 3968. ^ "Ministry of Defence and Tri-Service Senior Appointments" (PDF). September 2011. p. 7. Retrieved 22 January 2016. ^ a b "No. 58929". The London Gazette (Supplement). 31 December 2008. p. 2. ^ "New senior military officers appointed". Inside Government. 24 January 2013. Retrieved 24 January 2013. ^ "New Vice Chief of the Defence Staff". Retrieved 22 January 2016. ^ a b "No. 61450". The London Gazette (Supplement). 30 December 2015. p. N7. ^ "Air Chief Marshal Sir Stuart Peach appointed new Chief of the Defence Staff". Ministry of Defence. 22 January 2016. Retrieved 22 January 2016. ^ "New Head Of Armed Forces Is Appointed". Sky News. 22 January 2016. Retrieved 22 January 2016. ^ "Senior RAF officer who commanded Britain's intervention in Libya will be next Chief of the Defence Staff". The Daily Telegraph. 22 January 2016. Retrieved 22 January 2016. ^ BBC News (22 January 2016). "Sir Stuart Peach named as new head of UK armed forces". BBC News. Retrieved 22 January 2016. ^ "Sir Stuart Peach". Ministry of Defence. Retrieved 14 July 2016. ^ "NATO has a new top military adviser". Defence News. 29 June 2018. Retrieved 29 June 2018. ^ "Honorary Graduates" (PDF). University of Sheffield. Retrieved 22 January 2016. ^ "Honorary Fellows, Downing College, Cambridge". Retrieved 30 January 2018. ^ a b c "Stuart Peach". Retrieved 6 November 2018. This page was last edited on 23 March 2019, at 15:12 (UTC).